"Our crews are well trained, and are prepared with the experience and local knowledge to safely and effectively complete each job." 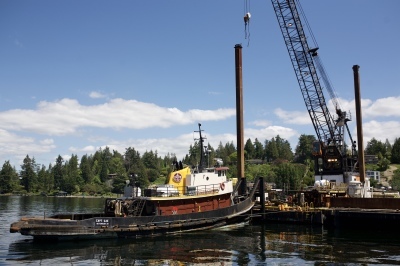 Our tugs are used to bring floating pontoon sections of the old bridge out of Lake Washington. Each pontoon had over 10,000 Ton Gross weight and were required to enter the Hirram Chittenden Lock chamber with 2 feet of clearance. Our vessels and crew were available 24/7. 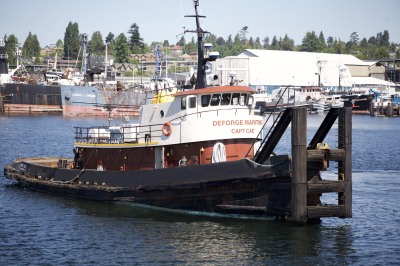 The Tug Capt Cae was used to transport bulk aggregate from Dupont, WA to the terminal. Also available on a 24/7 on call basis. Tow various ships from the West Coast through the Panama Canal on an ongoing basis. We have worked for All-Star metal scraping Navy Ships at their Brownsville, TX location. Our tugs are prepared to tow throughout Alaska including the outer chain/Bearing Sea. Our captains and crew have the experience and local knowledge to complete jobs safely and effectively within this challenging region.